The Fall of Eve - Music Video Breakdown! Robb Wallace Media -Music Video Breakdown! The Fall of Eve – Music Video Breakdown! 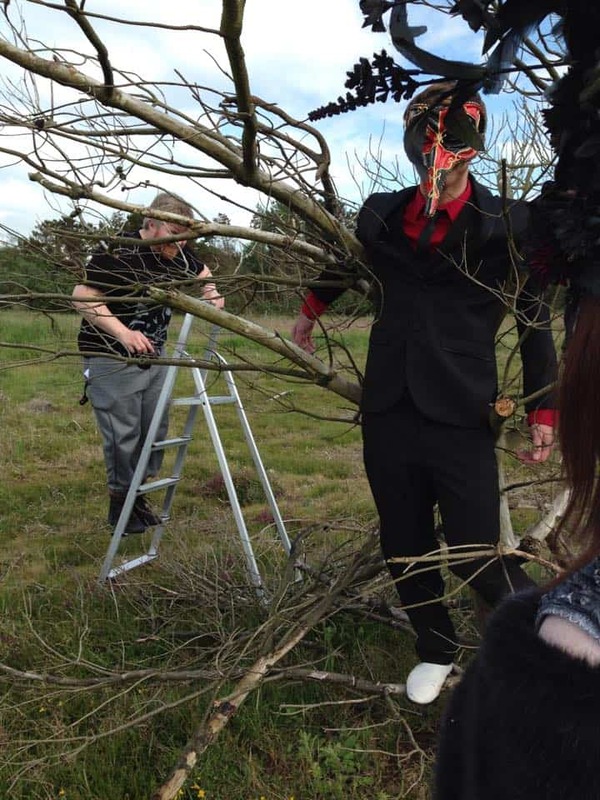 After successfully making The Fall of Eves- “Destiny” music video, I was contacted again by Laura and Mike about making their new video “The Devil Never Sleeps”. The initial concept for the video outlined by the band. Their concept was of a dark and light version of the lead singer Evangeline, this dual aspect of the character would be moving between light and dark worlds via a mirror, she is being chased by the devil/evil which at some point would touch and transform the light character into the dark. 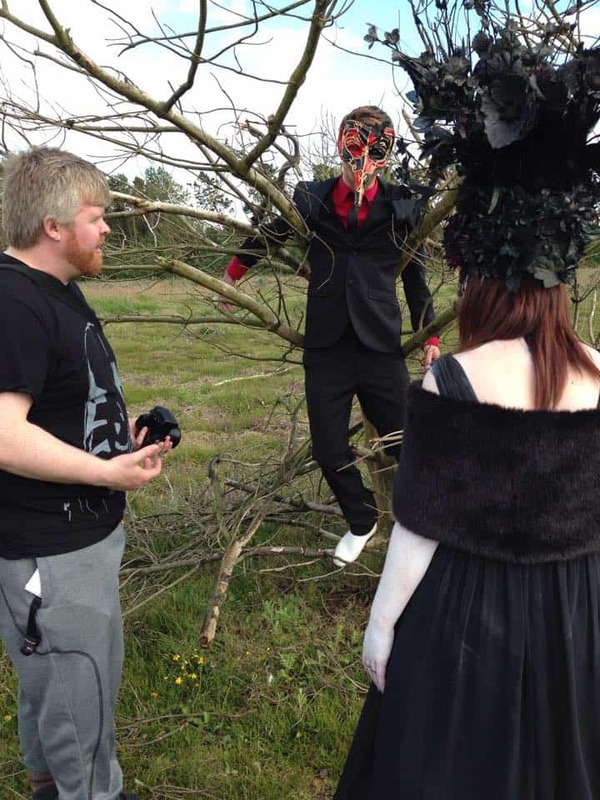 I took this idea and keeping with the theme and ideas presented by the band’s concept and simplified it for filming. The band’s initial concept of having three versions of the lead singer on the screen, interacting with each other was simply too complicated for purpose and within the time scale and budget impossible to deliver. Transforming three locations, with three characters all played by the same actress and all interacting on screen at the same time and transporting between each of the worlds via a mirror. Just think on that a minute! The refined concept sees the light version use the mirror as a portal into the dark lands but the mirror is also a portal to her dark self. Here she confronts the darkness in her ie the devil/evil. She then transforms back to the light version via the mirror but this time the darkness is awoken and now apart of her. It has transformed her from the inside. This made the shot viable and reduced the characters played by the lead singer Evangeline to two, which only appear on screen together once and as a simple fade between two shots. 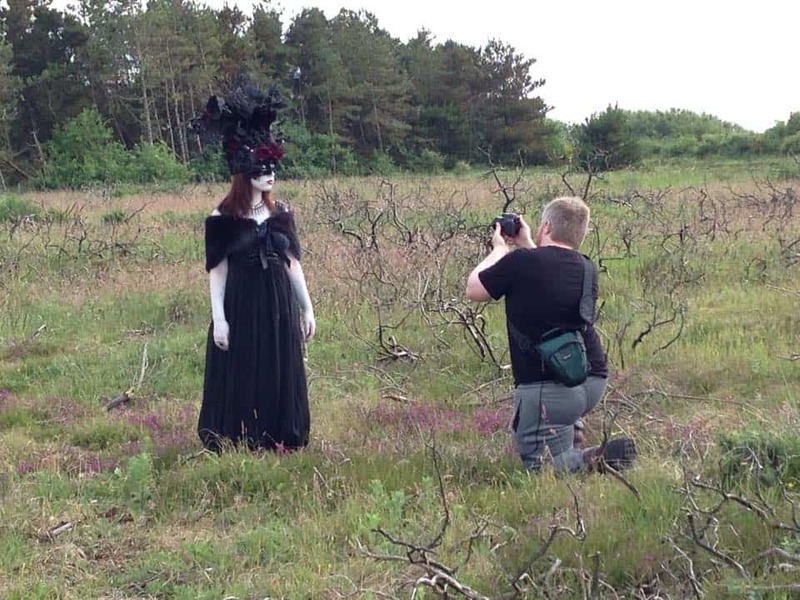 This allowed the whole dark and light aspects of the video to be filmed separately at different locations with only a few shots required to link them together. I also had from the outset the idea that I would shoot the entire video at double speed and then play it back at half speed in the edit for a unique silky viewing experience. 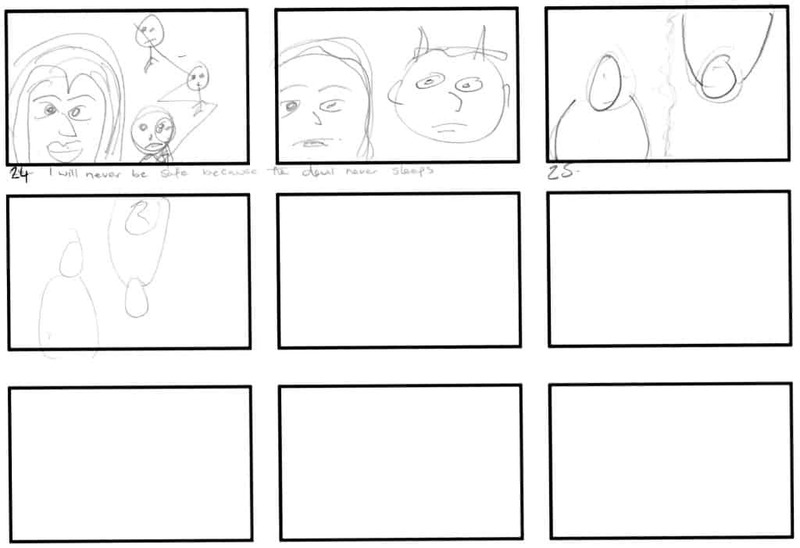 Once the concept was green light- I sat and storyboarded the full video (I know my sketches are ….. hahah). 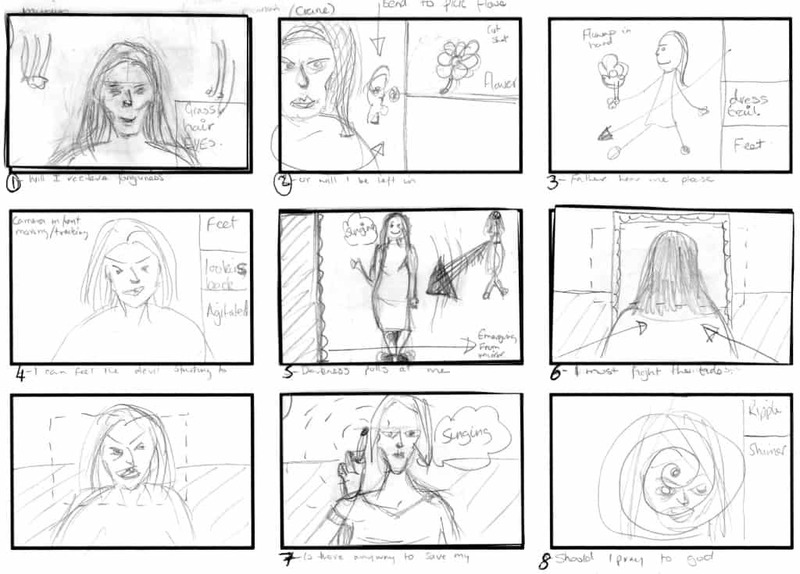 Storyboards allow you to visualise and work through your ideas. For me, they are also instrumental in working out how a shot is built. I can look at the picture and break down what I need to capture on set to make that shot work. I can also create test footage of myself experimenting with the techniques and VFX needed to create the visualised scenes. Evangeline is singing to the mirror and puts her hand up to touch the mirror. From this, I said ok, I need the camera to be locked off, say with a tripod and I need Evangeline to touch the viewer’s screen. At this point, I need to create a ripple that emanates from the touch. We measured through trial and error at exactly which point Evangeline finger in front of the lens appeared to touch the screen, we marked it off and in each take, she hit her mark perfectly. The next thing was how to make a ripple? This was archived in After Effects (this is the programme I use for VFX and motion graphics) using a radio effect at the perceived point of touch. Prior to filming in the field, I had created this scene in my bathroom mirror to perfect the idea. Plan it, try it, make it work, use it! 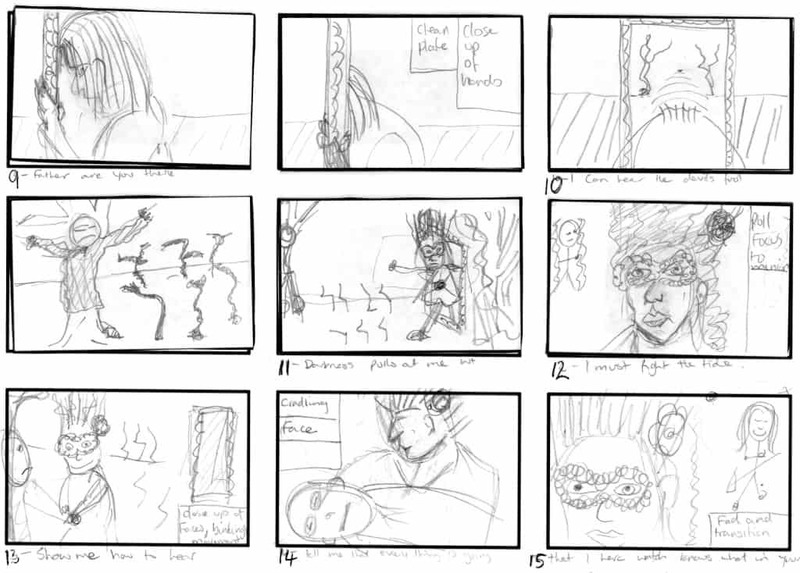 Every one of the 25 scenes was broken down to this level, for me this breakdown really gives the understanding of how the vision of the storyboard will be translated to the screen. The importance of knowledgable and expert friends/colleagues. Throughout this process, I had many emails back and forth with my good friend Greg Andrew.H e has extensive experience creating short films at Hingway Films and was responsible for the story scenes in the first The Fall of Eve music video shot by Robb Wallace Media. Greg came up to my office, it is invaluable to have a colleague that sees what your seeing and has the ability, confidence and experience to point that, that doesn’t work or we should change scene.. because … . .invaluable!! Once the dead wood was cut from the storyboards and the shots were all clear, me and Greg sat and reordered the shots to the order they would be filmed on the day. 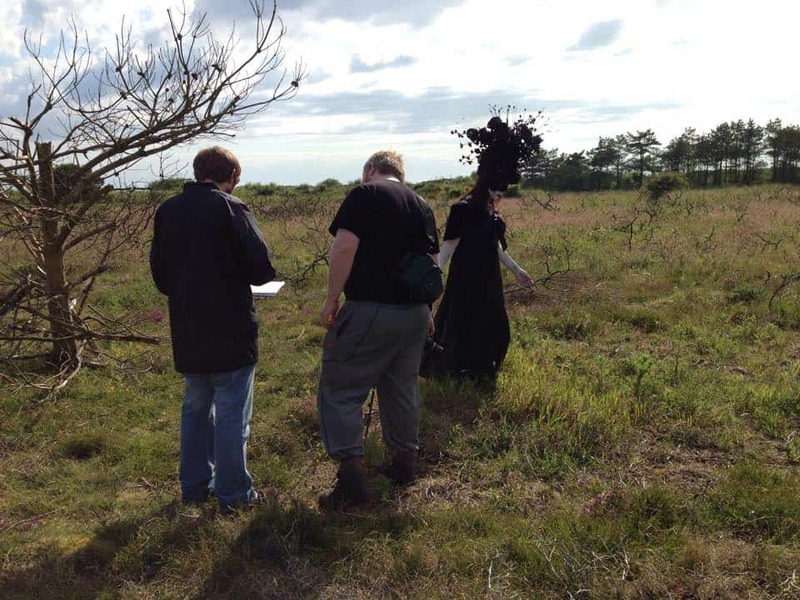 Due to the dark make-up set-up of the Dark character, we decided to film this character and her scenes first as it would be easier to remove the makeup and re-apply a simpler clear face in a field with no real amenities. 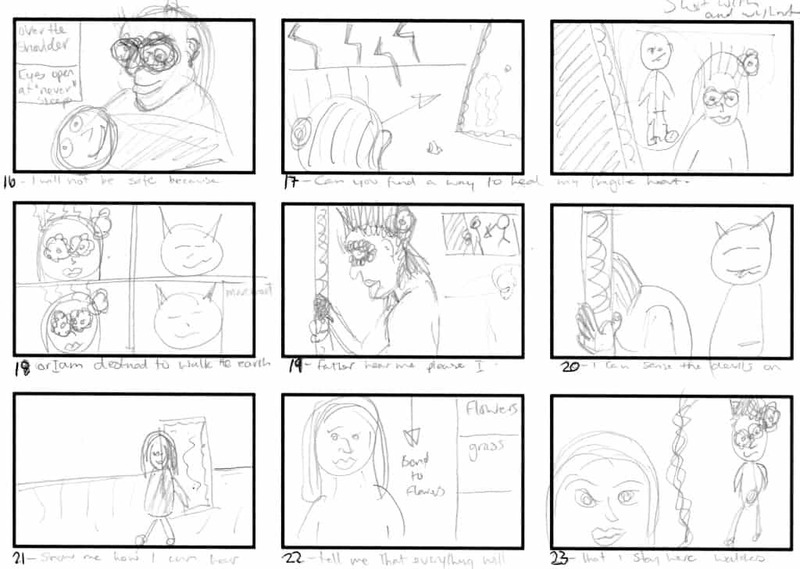 On the day of filming as most of the work had already been done, it was just a case of following the shot order, looking at the storyboard and the notes for each shot. Lots of prep makes things easy. Obviously, on the day, the terrain, the light from a shifting sky etc but almost everything else was pre-planned and ready for execution. On top of this everything was filmed at double speed, the song was sped up to 200% and played at this speed for all shots. Prior to filming Evangeline had been diligently practising mouthing her song at double speed. My workflow in Adobe Premiere Pro. Capture all footage – and label it accordingly to the shot list with the appropriate storyboard scene number. 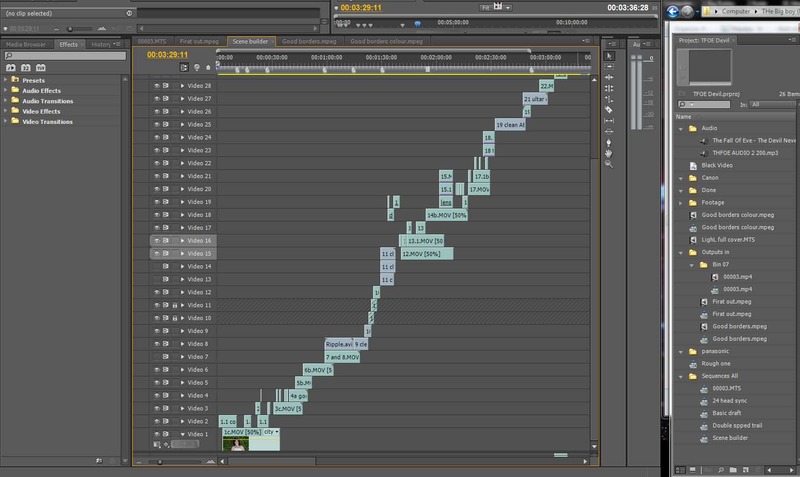 Build the timeline layering all shots one on top of the other, this doesn’t look to pretty but it makes sense to me and visually I can see every scene is on the timeline at a glance. Sync the audio scene at a time, remember everything was filmed at double speed, so the footage captured had to be slowed down to half its speed and then synced to the appropriate place in the song. There is no secret technique to syncing audio, just patience and slow breathing. Now that I have a rough overview of the entire song on the timeline, I export the scenes that need VFX and begin to work on them in After Effects. Create black borders and level up all shots, scene by scene, so the action is clearly framed between the black letterbox borders. 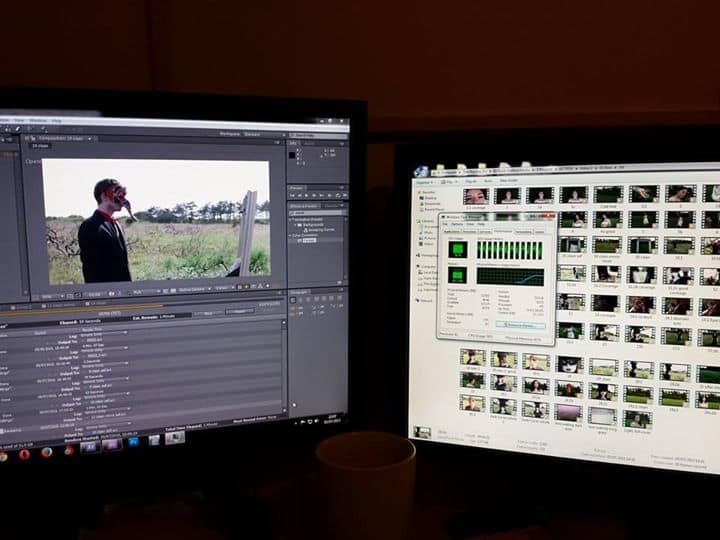 Finally, I exported the film and uploaded a copy to the bands YouTube for them to finalise and sign off. The filming took place on the 4th of July 2015,(8 hrs) and on the evening of the 6th of July 2015, the video was released by the band to their fans!! 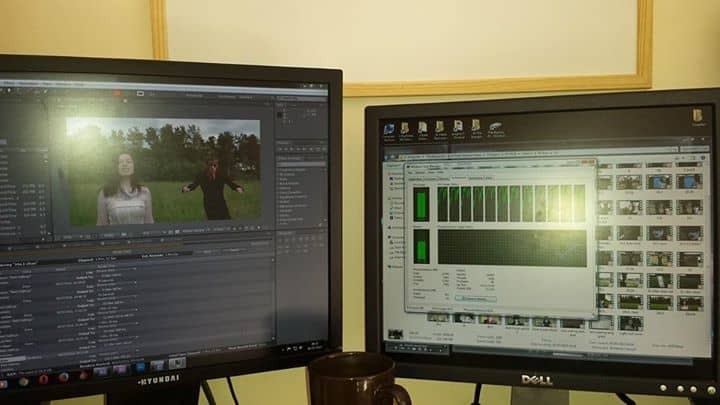 In just two and a half days I pulled in over 30 hours of editing time! Some people are just machines hahaha. 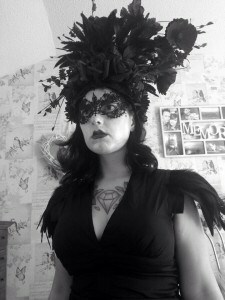 Glasgow music video, Ayrshire music video, Scottish music video, music video, metal video, female fronted singer video.